The eighth #SFFpit event, in which authors with completed SF/F manuscripts pitch them to agents and editors on Twitter, took place on December 14th, 2017. Here, I’ll provide the usual breakdown of who showed up and a discussion of some trends. First, however, you should be aware that this event almost didn’t happen. My co-host Michael Mammay and I had a frank discussion back in November about whether we should hold the event at all. This was in the Pitch Wars hangover period, and everyone in our Twitter feeds seemed to have some contest fatigue. We decided to proceed for a few reasons. First, because there’s no other event aimed at SF/F authors, who often have trouble gaining visibility in broader contests. Second, the pub industry slows to a crawl between Thanksgiving and New Year’s, so we figured agents might have time. And third, #SFFpit continues to have successes. 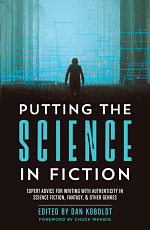 Like Matt Weber, who thanked #SFFpit when his book was recently published by Curiosity Quills. In the first couple of hours of last week’s event, I worried that we’d made a mistake. The turnout among both authors and literary agents seemed low. By my estimate, we had only a few hundred authors pitching, and the hashtag wasn’t even trending. Only a few agents had advertised their presence in the feed. Promoting the event to the writing community through blogs, social media, and other channels. Answering a never-ending stream of questions from angsty authors about rules, Twitter policies, hashtags, etc. Is it 80 man-hours for each event? Probably not. But it’s a significant chunk of time that Mike and I could spend writing. Or promoting our forthcoming books. My third book comes out in February, and Mike’s debut novel Planetside will be published in July. Side note, go pre-order that sucker. Luckily, things were about to pick up. At around lunchtime, #SFFpit started gaining traction. More agents began dropping in. 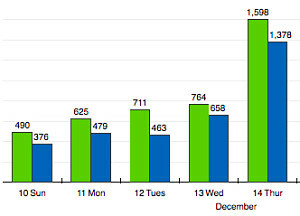 I saw a spike in web traffic (left), mostly to the contest page. Authors who’d forgotten about the event (or never knew it existed) were getting wind of it and jumped right in. We finally generated enough activity on the hashtag to attract some spam, which is sort of a minimum bar for success on Twitter. If the spammers start coming out, your hashtag has some visibility. Many authors reached out before #SFFpit to ask if there was a policy on the longer tweets. I didn’t have an official position, but reminded folks that since I regretfully have no formal control over the Twitter platform, my ability to enforce a now-arbitrary maximum length is minimal. In other words, authors were welcome to use more than 144 characters, and many did. A Silk Road sorceress with a temper. A magical heist gone wrong. When 16yo Stana is caught stealing from a djinni, she must overcome his superior power and her own explosive nature, or be trapped in his enchanted underworld forever. It uses 280 characters by my count, and it hits all the right marks (this one got several agent requests). There is a down side to longer tweets, which is that they’re truncated by the API I use to pull down all #SFFpit tweets for analysis. This means that I didn’t get the ending of the tweet, where most people put their hashtags. Not a big deal, but keep it in mind as you read below. 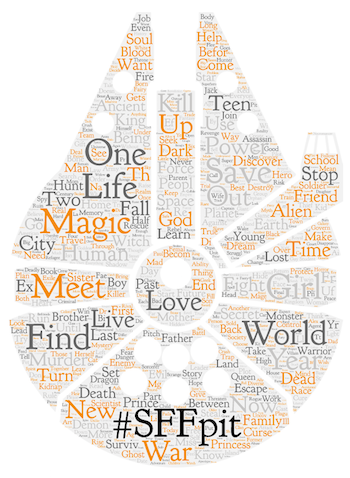 By my count, there were 750 pitching authors in last week’s #SFFpit. That’s slightly down from June’s 800+ authors, but still a 39% increase over last December. In the following breakdowns, consider that because of longer tweets I’m extrapolating based on the subset where I could get their hashtags. Young Adult (YA) was the predominant age category, representing 53% of pitches. Adult was #2 with 32%, and may be under-counted here because many authors pitching adult works don’t use an age category hashtag. Middle Grade (MG) was a distant third, accounting for 9% of pitches. 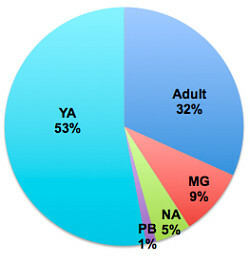 New Adult (NA) and Picture Book (PB) were the least common. Fantasy was the predominant genre, unsurprising given both its broadness and popularity. About half as many pitches were classified as sci-fi (SF). There’s a long tail of subgenres, the most popular of which was space opera (5%), followed by urban fantasy (2.5%) and fantasy romance (2%). Over 20 different genre/subgenre hashtags were used (that I saw), suggesting that many authors are taking advantage of them. As I mentioned earlier, Mike and I invite upwards of 40 literary agents to this event, including our own agents and their colleagues. My official tally: 31 agents from 22 different literary agencies participated in last week’s event. That’s as many as we ever had, but it comes with an important caveat. Not all of those agents announced themselves and/or provided submission instructions on the #SFFpit hashtag. In war-torn Hong Kong 16yo thief Mo stabs a witch & ends up cursed. 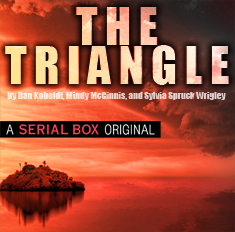 Now she must disguise herself as her victim & infiltrate the demon-infested witch-cities to break the curse. It’s a great pitch, and takes advantage of the longer format (~261 characters) to show off the unique premise. I can’t see all of the 60+ people who liked it, but a lot of them are friends and fellow authors who don’t know any better. Even so, there are at least a dozen legitimate agents who liked this tweet. Many were “stealth agents” who didn’t announce themselves on the hashtag. One wonders if such agents are participating quietly in hopes of flying under their competitors’ radars. I find it very interesting, and will be keen to learn where Alyssa ends up. Update: In a twist of fate, Alyssa ended up at Donald Maass Literary. Welcome, agency sister! On behalf of my co-host Michael Mammay and myself, thank you to everyone who came out for #SFFpit last week. Will we host another event in June? I don’t know. It depends on a number of factors, including our sense of agents’ appetites for pitching events over the summer. Stay tuned here and jump on my mailing list to stay up-to-date on future pitching events.